Polish disorganization is a terrible thing. Bottles get shoved in awkward places, and they get lost in the shuffle of glitter and bottle sizing. I'm suffering from this malady right now and it's unbelievably frustrating. My visits to Micheal's aren't paying off, and I keep coming up without Melmers, as much as I'm dying for one. We don't have the space for a Helmer, so a Melmer would do just fine. One good thing did come from this unorganized mess though. I rediscovered the cuties from Lime Crime, and paired Crema de Limon, the yellow from the collection, with Calypso Breeze (ORLY). Nothin' fancy, just some interesting dots. Shoving such beautiful bottles into a plastic container beneath the entertainment center is a far cry from the beautiful polish rooms of girls like Cristina and Caitlin. So if anyone sees a Melmer at their local Micheal's, let's talk. Aw, you succeed in offering something new again and again and again :) . 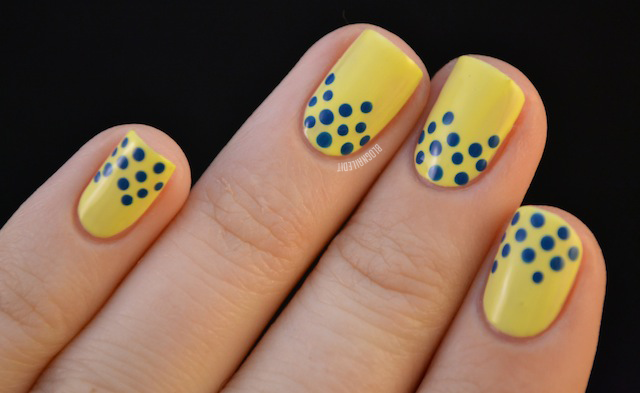 Creative take on polka dots..Love it! This is a great yellow! I love the simplicity. Oh I love this! So simple and lovely! Wow. How do you get your nails and cuticles to look so perfect? Love this mani!! Check out my tutorial on how to give yourself a manicure for some tips on getting your own nails to look and feel healthy. I store my polishes in a couple of spa towers next to my makeup area. Each one has 4 shelves which hold about 30-35 bottles each depending on the size of the bottles and how determined you are to make everything fit. It's a fairly slcheap solution and if I need to find a color, it is super easy.